Few activities are as rewarding as brewing your own drink. We’ve been making wine for years, and occasional batches of beer. Aside from tasting better than most of their commercial cousins, our home-brewed beverages get past some of the most extreme government cash grabs in the western world. Our pols have devised more layers of alcohol taxes than can be easily counted. Home-brewed hard apple cider is a somewhat more elusive drink than either wine or beer. For some time, we got by with tinned apple juice and wine yeast, and the results were largely drinkable. This said, the process of commercial canning clearly upsets the sugar balance in apple juice, and getting the resulting brew to taste like proper cider was challenging. That, and buying enough supermarket apple juice to create 23 liters of cider, while not quite as exorbitant as buying cider from the government-run liquor outlet in town, did involve a modest degree of credit card outrage. Black Rock is a manufacturer of home-brew beer kits. They hail from New Zealand… significantly, for about half the year, this is where most of the apples in our local grocery stores originate from as well. We discovered this past spring that, in addition to easy-to-operate kits for just about every species of beer on Earth, they do a kit for hard cider. Unlike beer kits, which involve a modest amount of chemistry and witchcraft, the Black Rock cider kit is breathtakingly simple. It has only two moving parts – a big tin of concentrated apple juice, and a packet of yeast. 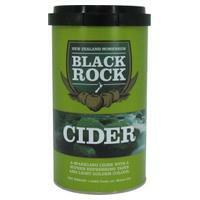 Unlike supermarket apple juice, the juice concentrate in a Black Rock cider kit is really intended to make cider. In addition to the cider kit itself, you’d need some brewing hardware, two kilograms of dextrose to add to the cider itself, and another small helping of dextrose to prime the bottles your cider will ultimately reside in. The instructions included with the Black Rock cider kit are agreeably lucid, but they’re printed in somewhat diminutive type on the tin’s label. Much the same instructions can be found at the Black Rock web page, and printed out in a more readable form. Brewing up a batch of cider with a Black Rock cider kit is considerably less involved than brewing either wine or beer, and I suspect that either a partially blind chimpanzee or even a liberal politician could successfully complete one of these kits. Someone who works for a living could do it in their sleep. Once the apple juice concentrate, water and yeast have gotten together, it requires two to three weeks for the cider to complete its primary fermentation, after which it will be ready for bottling. The instructions for the cider kit suggest that you’ll be able to drink the results of your labors after five weeks. In fact, leaving it to repose in its bottles for at least two months results in a much smoother drink, and is easily worth the wait. As with Black Rock’s beer kits, the results of the cider kit are just this side of god-like. The cider it produces is dry and flavorful, robustly carbonated and subtly nuanced. It tastes better than any of the commercial tinned ciders we can buy, and is easily comparable to real UK draft cider… sadly now little more than a distant memory. I hasten to add that unlike most commercial ciders, cider produced with a Black Rock cider kit won’t contain any nasty ingredients. Among the most egregious of nasty ingredients it doesn’t contain would be the cochineal coloring used by many commercial ciders to keep their appearance consistent between batches. Cochineal is a food dye made from the bodily fluids of insects. Perhaps the most noteworthy aspect of the results of a Black Rock cider kit is that its cider doesn’t taste like something that emerged from a kit. Where we live, a Black Rock cider kit and enough dextrose to complete 23 liters of cider costs under twenty-five dollars. This is comparable to what eight 440-milliliter tins of commercial Strongbow cider – a little less than four liters of drink in total – would cost us, with all its many and varied taxes included. The Black Rock cider kit enjoys pride of place as our favorite retail discovery of the year. It’s easy to use, fun to complete and a serious party once it’s ready for polite company. I doubt that even wholly inexperienced home-brewers would find it unreasonably challenging.